Now, anyone who knows me knows I have a dislike for backhoes. My day started out as being just like any other day in paradise here in south-east Queensland when I visited my mate’s farm and saw it. From my day starting out beautiful, as I drove the long driveway what I saw in front of me gave a cold shiver down my spine … and the memories started flooding back. A bit like a childhood memory of a dental surgery gone wrong, I hold very vivid memories of the days way back in the 1970s of my interaction with a Case multi-sticker backhoe and have held that grudge ever since (so much so that I only ever owned one Case backhoe in my 45 years in construction). ‘Dinosaurs of the deep’ in my opinion but, then again, being an excavator tragic and having a distinct liking for loaders, one could almost forgive me. Not to be underestimated for the massive contribution backhoes have made to the construction and farming industry (as I understand that most backhoe owner/operators are merely an excavator owner/operator in waiting and training), I can reflect back when backhoes were ‘king of construction’. Who could ever have imagined that? JCB may have the world on a string at present with the class act portrayed in the range of backhoes made available to the world but there was a time when, and I mean way back when, an Australian affiliated company (David Evans Group) had a huge input in the manufacturing and supply of backhoes and they held the majority share of construction and farm backhoes sold here in Australia. As any rural landowner will tell you, water is the answer to running a successful farming operation and a guarantee of getting a good feed into your belly at night. Not enough water and your crops fall away pretty darned quickly, let alone the condition of your stock, but failure to supply good water to the cookhouse and you may as well take up a townie’s residence because you won’t be welcome back home until you have fixed the problem. That was the case (pardon the pun) when I came over to catch up on a good mate of mine who had a workshop and farming operation in the state’s southeast. This old Case backhoe sat along the side of the driveway atop a very large wet patch of ground just down from the homestead. A couple of worried faces, able-bodied blokes with shovels and a young bloke sitting in the operator’s seat ready to commence the arduous but necessary task of finding the dreaded leak in the main house supply water pipe. What really got me thinking was this is about as ‘polar opposite’ as you could get. On one side we have ‘Kahn (The Mullet) Alford’, all of 16, not old enough to get a car licence yet but more than capable of driving and operating anything farm related, who has secured a local diesel fitter and boilermaker apprenticeship and is living proof that there are still self-believing and self-driven young kids out there ready to do the hard yards and develop a passion in their chosen profession. On the other side of the scale is an old Case backhoe still in working mode … between 40 and 50 years old and still going (not strong but still going). Now this machine may have caused some owners some grief but the time spent on researching this particular rig has caused me untold grief. Without the help of the ‘Case equipment gurus’, whom I had to call for assistance, namely Graham Murphy and Satch Santilli (previously Case but now of Semco Group), I would not have secured the final answers to the myriad unanswered questions. 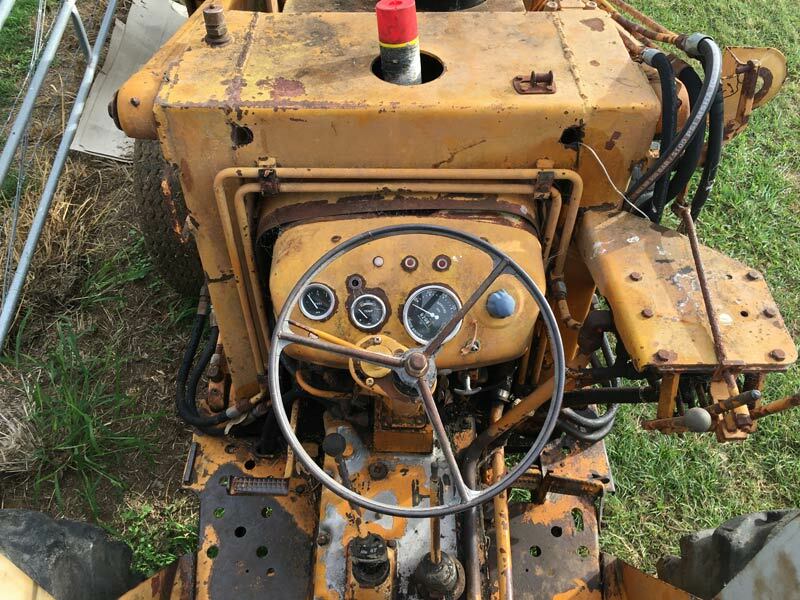 This machine is based on an English-made and designed three-cylinder diesel Case/David Brown 885 ag tractor and has had the CE/backhoe loader attached to convert it into a J. I. Case 360B backhoe. These were the forerunners to the hugely popular Case 580 backhoes that followed and it is claimed that they were the first full-chassis and dedicated design for CE rather than a converted ag tractor. 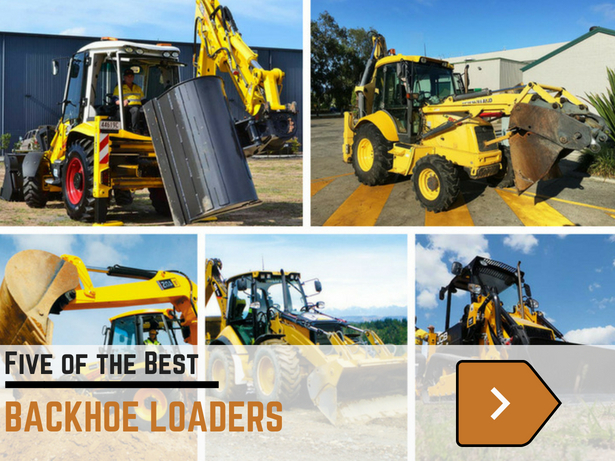 Today we sit and admire the size, design and horsepower of the big dozers, loaders and excavators but the pages of earthmoving history will prove that all of these were derived from the humble old ag tractors. The serial number identifiable on this machine points to it being a very early 1970ish model. J.I. Case agricultural equipment commenced its Australian operation in 1900, however Case did not commence local manufacture seriously until 1963 when it acquired Murray Bridge (South Australia) implement manufacturer, Male Brothers. Local subcontractors were engaged to manufacture of a number of attachments for crawler and wheel loaders; in 1961 a small manufacturing department was set up in the Northmead head office. Initially Case had an engineering facility and made ploughs and combine fronts at Murray Bridge before converting the facility to construction equipment manufacture and assembly in 1965. 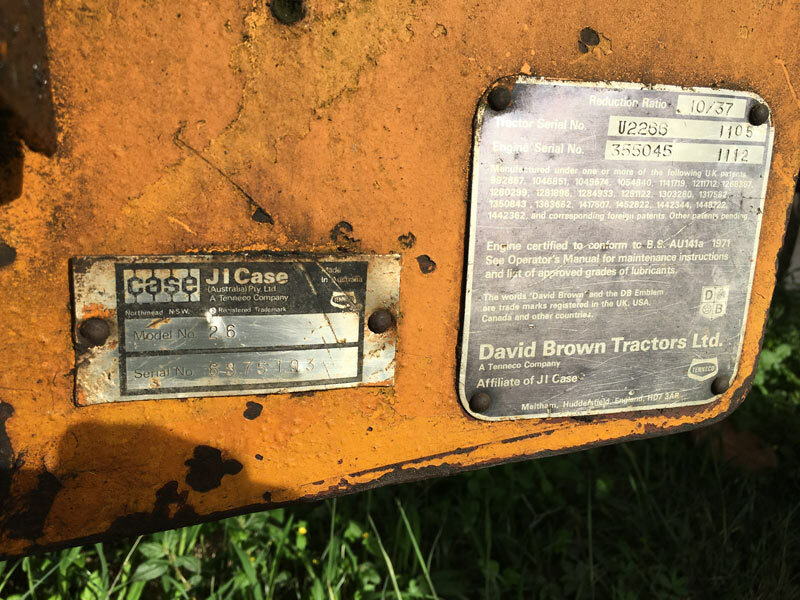 Case were manufacturers of wheel tractors and loaders, backhoe-loaders and crawler attachments and had a few locations, namely Northmead (Sydney), 1961 to 1965; Murray Bridge (South Australia), 1965 to 1983; and St Mary’s (Sydney), 1983 to 1987. However, a series of poor business decisions witnessed this once prominent manufacturer/supplier fall from its leading position to a non-manufacturer in the 1980s. This model is a three-sticker operation which controls the boom, dipper and bucket but the slew controls are located on the floor, side shift is via a slide shift, the support legs are easily accessed on the operator panel to the right of the controls, and the hand throttle on left side of steering wheel. This provides constant throttle to the backhoe operation. A tidy 4:1 bucket configuration finishes off the front end of the tractor quite tidily as this was a new innovation for the day. The three-cylinder 2.7-litre watercooled David Brown diesel engine developed about 47hp. Transmission on the old girl was stick shift, with clutch and brake being floor-mounted and located on either side of the steering column. 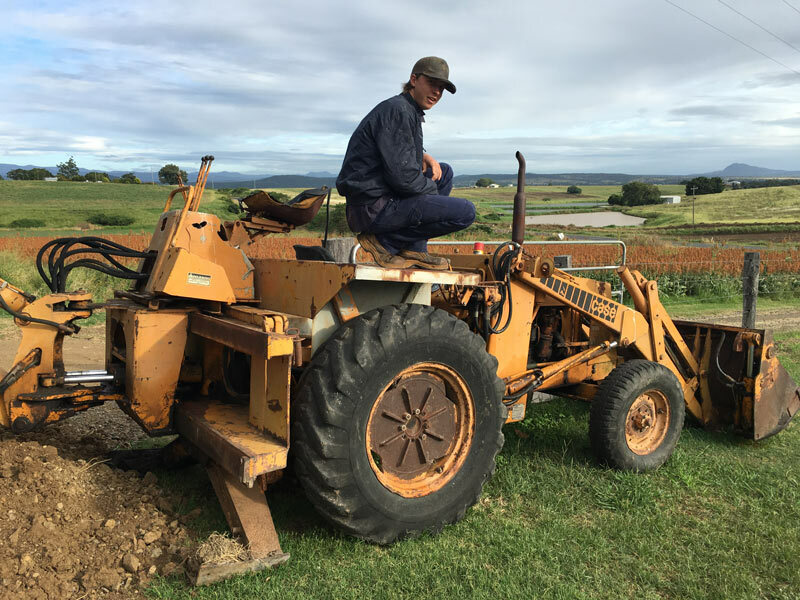 The old Case has plenty of dipper, boom and bucket arm slap in it, but after all, it is a farm tractor and it continues to serve its purpose quite well. One thing that is definitely Case is the hoist, dipper arm ram configuration … interesting but effective for the day. Filters are all easily accessible for the quick change these days, more from dirty fuel than being overworked. Getting a contractor out to any farm for such a small project (in the contractor’s eyes) is always going to be difficult and costly so it is quite sensible for farmers to have several items of well-worn equipment suited to the various roles that are needed to keep a rural operation up and running. In this instance, house water supply is a priority, and after exposing the poly and a bit of scratching along the pipe, the leak was secured with spare fittings from the old workshop and the woman of the house was once again happy. Whether it’s in the bush or the smoke, the same rules do apply: happy wife, happy life … sometimes! 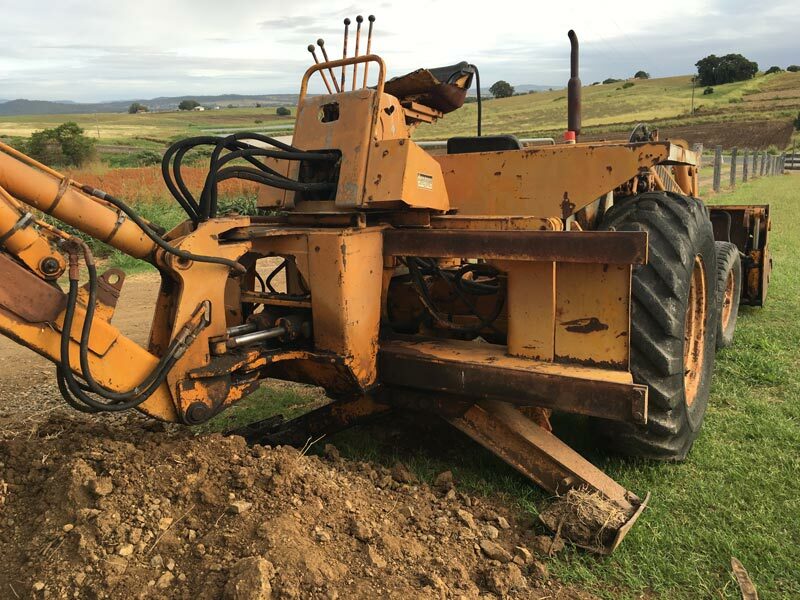 When Hydraulic Rockbreakers hit the Australian market in the mid ‘70s, Case proved to be a very popular backhoe in which to fit a rockbreaker. The very first rockbreaker/backhoe in Australia was a Case backhoe, and from recollection it was Sydney-based company Burwell Plant Hire which imported a Krupp 200 hammer and had it fitted as a test run prior to the first ever excavator fitting of a hammer. Part of the reasoning was that Case had two hydraulic slew rams, which meant you could lock your slew in place and forget the rest once you started hammering. I purchased a new Case backhoe in the ‘90s, fitted a Krupp 200 hammer to it and put it underground at Northparkes Mines and had a hugely successful run with it. Plenty of contractors in the day made good money with these machines and it was a shame to see the brand disappear from the Australian market for a while. However, that aside, I still reckon that most backhoes go to ‘backhoe hell’. Very few go to ‘backhoe heaven’ but this one just refuses to lay down and die! Not going strong but still going, not looking good but still working, no longer the fast and streamlined top-of-the-range piece of equipment of its day, and looking every bit to the day of its 40-50-years-plus age … no amount of botox is going to change it but you have to take your hat off to the legacy these old Case backhoes have left on our industry. 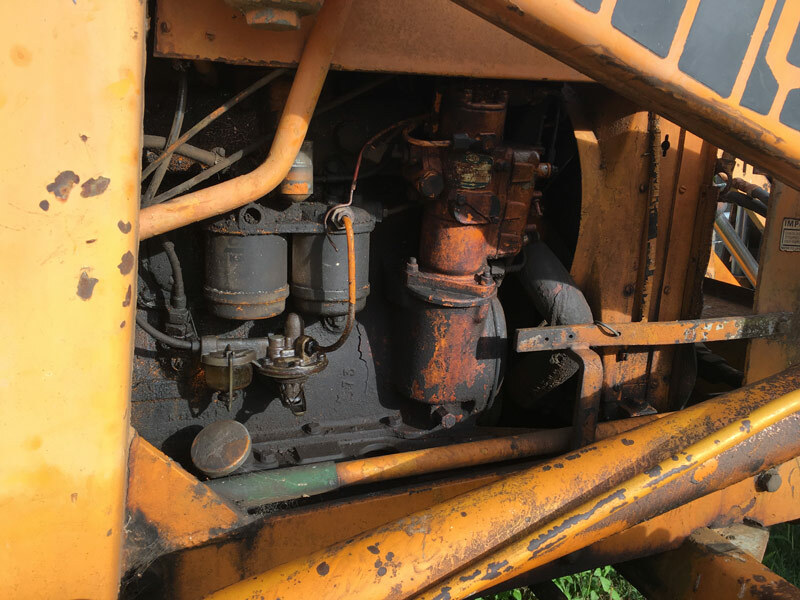 This one (although it may not look much) has definitely earned its place as a true survivor as an old Aussie-made or modified piece of equipment and can justify its place in the library list of ‘Ronnie’s Rusty Relics’.